¿ Qué tal vosotras para Coruña 42 ? 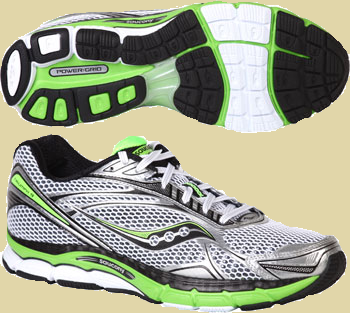 Gone on diet, the Saucony PowerGrid Triumph 9 is ready to take you further and faster. 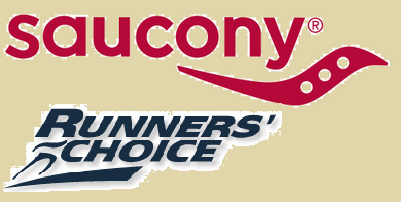 Equipped with Saucony’s midsole injection-molded foam, PowerFoam, together with PowerGrid to deliver excellent comfort while maintaining a responsive underfoot. Moving with the new trend of mid-foot running, the PowerGrid Triumph 9 come came in a 8mm heel to toe drop (Previous Triumph come in 12mm offset), to encourage midfoot strike. Comfortride™ Sockliner : Breathable, moisture wicking, anti-odor and anti-microbial Comfortride insole provides improved step-in comfort with rebound properties. Hydrator Collar™ : Gives next to skin comfort and maxizes wicking and the Comfortride sockliner is antimicrobial and breathable. HRC™ Strobel Last : High Rebound Compound : Full lenght board placed uder the foot which increases cushioning and step-in comfort. IBR™ Plus, Forefoot : A Flexible lightweight material which has enhanced cushioning and durability properties then traditional blown rubber. 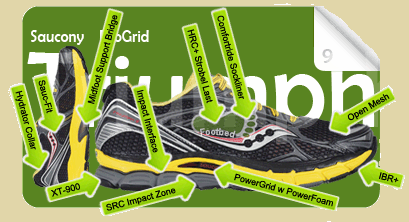 Impact Interface : Sandwiched at the heel between the SRC Impact Zone and the midsole. This thermoplastic elastomer device cushions and isolates heel impact. Midfoot Support Bridge™ : A rigid material in the shank area of the midsole keeps the foot neutral in the midfoot phase of the gait cycle. 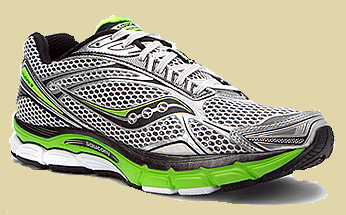 PowerGrid™ w PowerFoam™, Midsole : Combining Saucony's innovative PowerFoam with their industry acclaimed Grid technology to provide the runner with superior cushioning and responsiveness on every run : PowerFoam™ : An injected molded which is lighter and more responsive than SSL EVA : PowerGrid™ : Combining a innovative material, PowerFoam with industry acclaimed Grid technology to provide superior cushioning and responsiveness. Open Mesh : A breathable lightweight open weave mesh with overlays to lock down the foot while providing un-restricted movement. Sauc-Fit™ : A unique fit system in the upper that not only locks the midfoot onto the platform but also keep the heel secure and comfortable. SRC™ Impact Zone : Provides shock attenuation and sets the foot up for a smooth transition : SRC™ : Super Rebound Compound : Mixture of rubber and polymers used to absorb impact and provide great cushioning. 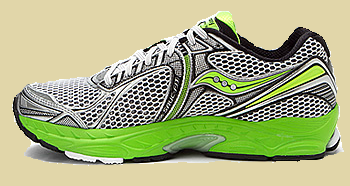 XT-900™, Rearfoot : Carbon rubber provides durability in the heel and medial forefoot. La nueva campaña de Saucony utiliza un concepto intangible como la fuerza. La campaña está dirigida a todo corredor o deportista en general, motivado por la práctica deportiva y que busque superación personal. Cada corredor encuentra su motivación de diferentes maneras, algunos piensan en mejorar registros, otros en acabar una maratón, y algunos simplemente por encontrarse mejor. Donde sí coinciden todos es en una fuerza que les motiva a superarse día a día. A medida que vamos alcanzando nuestros retos vamos encontrando nuestro “STRONG”.